Weight Distributing Trailer Hitch & Equalizer Hitch with Sway Control. I'd like to discuss a very important towing accessory you should seriously consider in order to tow safely. Specifically - Weight Distributing Hitch Systems and Sway Control. 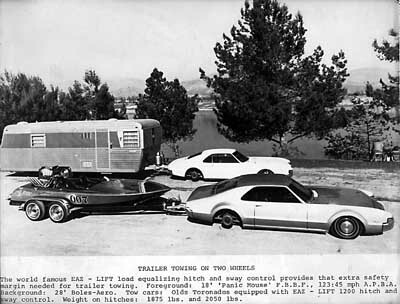 I think the most effective demonstration I have ever seen of this product in action was a video I saw where a front wheel drive Toronado had it’s back tires removed after it was “hitched up” to a boat trailer using a weight distributing system. We’ve all seen trailers that were so heavy on the hitch that the rig sagged in the hitch section. Well, as you can see in the picture below, that car towed the trailer around and around the parking lot without it’s bare back wheels ever touching the ground! That’s how effective these systems are. And by the way, if you tow horses, these weight distributing hitches make a world of difference in the comfort level of the animals. Bolt together adjustables or weld together. Generally necessary when towing horse trailers, heavy equipment trailers, long travel trailers, car haulers and many large boats. Eliminates "fish tail" sway problems. Used in tandem with weight distribution system or alone. I’ve done a lot of towing in my day. I take trips all over the western United States every year and I tow a trailer or boat wherever I go. There are some accessories I will not tow ANYTHING without. Weight distribution bars are one of them. Sway Control bars are another. Most trailers should have some type of sway control device. This lifesaving piece of hitch equipment will decrease the sway effects induced by passing trucks and busses or strong side winds. They can make towing safer when driving under adverse weather conditions. I’ve been extremely impressed with the sway control in emergency conditions. When you must make sharp turns or moves to avoid a collision, the sway control prohibits the “fishtail” action that trailers make when you are forced to swerve suddenly. A customer of mine was involved in an accident years ago. 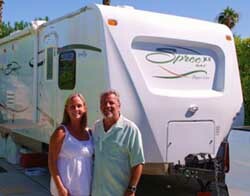 He had purchased a hitch for towing the family trailer on a trip to Lake Tahoe, CA. On the way back, a car sideswiped him on narrow Highway 50. He swerved to avoid hitting the passing car, and his trailer “fishtailed” right into the side of the rocky mountain next to the road. Needless to say, the trailer was totaled. He and his family were all right but had he purchased the sway control like I tried to convince him to do, that trailer would never have hit the mountain and been damaged in the accident. Would I have made more money if he had bought the extra equipment? Of course. But he truly needed the sway control and, in hindsight, it would have saved him a great deal of money if he had invested a little more at the time he got hitched. I was driving back from Eugene Oregon a couple of years ago when the traffic on I-5 came to a standstill. It looked like we were in for a long wait so I left my truck to talk with a neighboring trucker to see if he had heard anything about an accident on his radio. It seems that an older couple driving a truck with an Airstream trailer had had a horrendous accident up ahead of us. About 2 hours later, when we finally drove by the accident, I looked over at the overturned trailer. Sure enough, it had weight distribution bars but no sway control. On trailers over 24 feet long, the manufacturer recommends two sway controls, one on each side. Sway control is also extremely helpful to those who are new to towing and may not have a great deal of confidence behind the wheel yet. The ride is so much more controlled and comfortable that you will quickly appreciate the difference in your towing experience. There are some new hitch designs on the market that combine the weight distribution and sway control functions. They are very expensive but my customers who have tried them swear by them. I would suggest that if you are very nervous about towing you might consider some of these newer towing options. Look, all these safety accessories do cost extra money. But they’re inexpensive compared to the damage that could result in NOT using them. And I never want to hear that someone was injured (or worse) because a customer wanted to pinch pennies rather than keep his family safe. I’m sorry if that sounds harsh, but towing is a serious business. I would much rather you not tow at all than to tow “half –ssed”. This is one area where you need to make sure you are as safe as possible. Where was I? Oh yes, safety equipment. Please read my articles about Towing Safety.